weft knit fabric which forms two reversible l:l knits, which are matched so that the plain stitch wales of one side are against the back stitch wales of the second knit. Both sides of the knit are in the form of face stitches. Fabric is distinctive for its low extensibility and greater fullness. A basic i. k. may be modified to take various patterns. 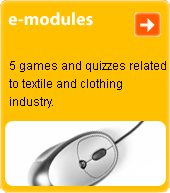 Is used in a wide range of clothing.